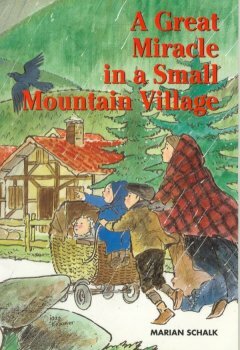 This story happened a long time ago, in a small village. That village lies in the middle of the mountains in Germany. The people who live there are poor. Walther no longer has a father. That is why his mother has to work on a farm. One day something very bad happens. Grief comes into Walther's house. They have to suffer hunger. Doesn't the Lord take care of them? Yes, a great miracle happens there. The God of Elijah is still alive! It is very quiet in the village where Walter lives. Most of the people are still sleeping, but Walter is already awake. He is tossing and turning in his bed. He no longer can sleep because he is so cold. Outside it is freezing very hard, and Walter has only one blanket. He pulls it high over him. Then Walter tries to fall asleep again. At seven o'clock he really has to get out of bed. He has to find sticks of wood for Mother so she can start the fireplace and the woodstove. Mother does her cooking on the woodstove. When the oven is nice and hot, she can bake the bread. Mmm. When Walter thinks about bread, he hears his stomach growl. He is already hungry, but first he will have to try to get some more sleep.... Walter again tosses and turns. He thinks about his two sisters, about Elsbeth and Elise. They are sleeping next to Mother in the big bed. They are not cold. Surely not. If it were possible, he would like to crawl in next to them. But no, that would not be right. After all, he is the oldest. He is already eight years old. He has to help Mother now that Father is no longer here, but sometimes it is very difficult. He also would like to play with the boys of the village, and that is just about impossible. Every day he has to watch Elsbeth and Elise while his mother goes to work on a farm. For her work she receives flour and money. Some time back, when Father was still alive, things were different. Then Mother was always at home, and Father earned the money. But now that Father has passed away, they have become very poor. Walter turns over again. He worries about how things will go. Then... he falls asleep after all. 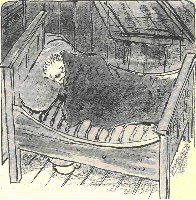 Mother stands next to his bed. She tugs on Walter's arm. "Come on, boy, it is already close to half past seven. We have slept in. Will you quickly find us some wood? Then I can wash Elise and Elsbeth and get them dressed." When mother has gone downstairs, Walter bends his knees by his bed. "Lord, wilt Thou take care of us today," he softly prays. Then he quickly gets dressed. It is very cold upstairs. Walter washes himself in the kitchen and then quickly goes outside. There is still a big pile of wood. It's a good thing, thinks Walter. At least we will not have to suffer from the cold. This winter still can last a long time. When he comes in a little later, Mother already has a warm breakfast made. Hey, that surely tastes good. It makes him feel cozy and warm. After breakfast, Mother picks up the Bible. 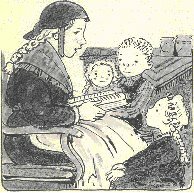 Walter may keep little Elsbeth on his lap while Mother reads the story of Elijah. In that story hunger came into the land, but the Lord cared for Elijah. He made the ravens bring bread and meat to Elijah. Elijah did not have to suffer hunger. Walter thinks it surely is a nice story. He is still thinking about it. "How did it actually happen? How did the ravens know they had to take care of Elijah?" Walter asks. "We cannot understand that," Mother says. "It was a great miracle." Walter goes to the shed to milk the goat. After a while Mother has to leave again. Then he has to stay inside to take care of his sisters.